In May 2018, we had the opportunity to visit Gee’s Bend, Alabama, located on a remote peninsula in the Alabama River, and document the oral histories of 15 community members. This opportunity was made possible by a scholarship from the Lang Center and inspired by a class taught by Professor Allison Dorsey of Swarthmore’s History Department. Many of the women from Gee’s Bend are internationally renowned for their quilts, but not many people know about their individual experiences growing up in Gee’s Bend. While it is understandable that many observers admire the quilters for their art, the quilters have often been described uniformly. In 2017, Tinnie Pettway, an elderly quilter, reached out to Andrea Packard, Director of the List Gallery, while she was in Gee’s Bend doing research for an exhibition and asked if Swarthmore could help record the traditions and values of her community. The purpose of the Gee's Bend Oral History Project is to preserve the stories that might otherwise be lost, learn more about the conditions in which the quilting tradition developed, and explore the variety of quilters' individual perspectives. The local community members shared their experiences with farming and religion, which are deeply rooted in their lives, and some told us stories about participating in the Civil Rights Movement. 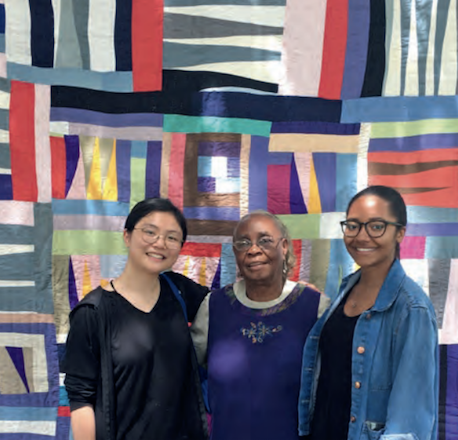 Luo ‘19 and Williams ‘19 with Mary Lee Bendolph, in front of one of Bendolph’s quilts. Photo by Rubin Bendolph Jr.
We are thankful for the incredible opportunity to have had conversations with the people of Gee's Bend. Not only did we get first-hand experience in recording oral histories, but we had a chance to sit down and have informal conversations with everyone face-to-face. We were able to feel what it is like to physically be in Gee’s Bend, to see the women working with their quilts in their homes, and to better understand where this particular tradition developed. Quilting has been passed down for generations among the women of Gee’s Bend for more than 150 years. Women quilted as a way to endure the legacy of slavery and find ways to keep their families warm during cold winters. Lacking basic tools or supplies, the women used old jeans and clothes that were worn out by their growing children, and they lined their quilts with cotton from the fields. Physically being in Gee’s Bend and listening to stories of quilters and other residents made us realize the importance of the culture context in relation to the quilts. The background stories make the quilt become alive whether they are in the home of a quilter or in museum settings. When we interviewed people from the community, they told us that they don’t typically think of quilts as art but just as things to keep them warm and safe; a quilt becomes a symbol of motherly love. Mothers sew their care and prayers for children into the quilts. On our first day, we visited the house of quilter Mary Lee Bendolph where her son, Rubin Bendolph Jr., hung many of her quilts on the porch for us to see. The triangles in Mary Lee Bendolph’s quilts represent people from her family, and are usually made with old clothes that person has worn before. Tinnie and Minnie Pettway, sister quilters, told us that they used to lay six or seven quilts on top of themselves before sleeping in the wintertime, because the fireplace was far away and the fire often went out in the middle of the night. Their mother taught them how to quilt when they were young, and they later made quilts for their own kids. Claudia Pettway Charley, daughter of Tinnie Pettway, now runs a company called That’s Sew Gee’s Bend, to promote and preserve the tradition of quilting. Many of the quilters never expected their quilts to be exhibited and collected in museums. During our trip, we met Rita Mae Pettway, who has been quilting for 65 years in Gee’s Bend. We asked if she ever thought of herself as an artist. She said, “It [quilting] is just something I like to do” because it comforts her. After our interview, we watched Rita Mae Pettway hand sew a quilt in her quilting shed that was built by her daughter, Louisiana Pettway Bendolph. The needle in her hand went up and down, binding together the quilt top, batting, and backing. On the ground beside her, there was a basket of quilt tops that she was working on for her grandchildren. Gee’s Benders’ love is shown in the quilts of the women quilters. When we met the local community in Gee’s Bend for the first time, everyone gave us big hugs and graciously welcomed us into their homes. During the week of our visit, we heard stories of family love, religious love, love for the quiet peace of Gee’s Bend, and love for quilting. When the Bendolph family came to Swarthmore in late September, they brought that warmth, love, and blessing to our community. The love they shared stays with us through the quilts of Mary Lee Bendolph that are on display in the List Gallery, and is a reminder for us to seek out love and share it with each other in our own community. In relation to the two exhibitions, Piece Together: The Quilts of Mary Lee Bendolph in List Gallery and Responses to Gee’s Bend in McCabe Library, we produced a book that documents, shares, and honors the lives of individual quilters and other residents of Gee's Bend. A free copy of the book can be obtained at List Gallery, Swarthmore College. An online version of the book is also available here.